TALLAHASSEE, Fla.-- The school resource deputy at Marjory Stoneman Douglas High School waited outside the school building as the shooting unfolded last Wednesday. Scot Peterson, the deputy, never went in after taking a position on the west side of the building, Broward County Sheriff Scott Israel said in a news conference. Peterson resigned on Thursday after he was suspended by Israel pending an internal investigation into his actions, Israel said. Surveillance footage from the high school was not shown live, as responding officers initially thought. "At first the guys are hearing, 'Oh he's on the second floor,'" Pustizzi said in the news conference. "Well it's not true. Because we have people on the second floor, and the people are saying, 'No, he's not on the second floor.'" The delay led police to brace for a shootout when the gunman was actually long gone, Coral Springs Police Capt. Brad McKeone said. But McKeone, one of the responding officers, said the delay did not hinder access to the victims. "It had no delay. It didn't slow us down to getting us to anybody," McKeone told CNN. The main difference, he said, was that officers thought they were going to confront the gunman. In reality, the shooter had already left Marjory Stoneman Douglas High School in Parkland. "I expected to be in a gunbattle," McKeone said. Broward County Public Schools had not responded to CNN's request for comment Thursday about the school surveillance system. The Broward County Sheriff's Office, which is leading the shooting investigation, also has not explained why the video was on tape delay. McKeone said about 20 to 25 officers were on the first, second and third floors of the school when they thought the shooter was still inside. By 2:54 p.m., police were watching the gunman make his way through the building. "They are monitoring the subject right now," one person says. "He went from the third floor to the second floor. He may have a gas mask on now. Stand by for further. They're monitoring him on camera." 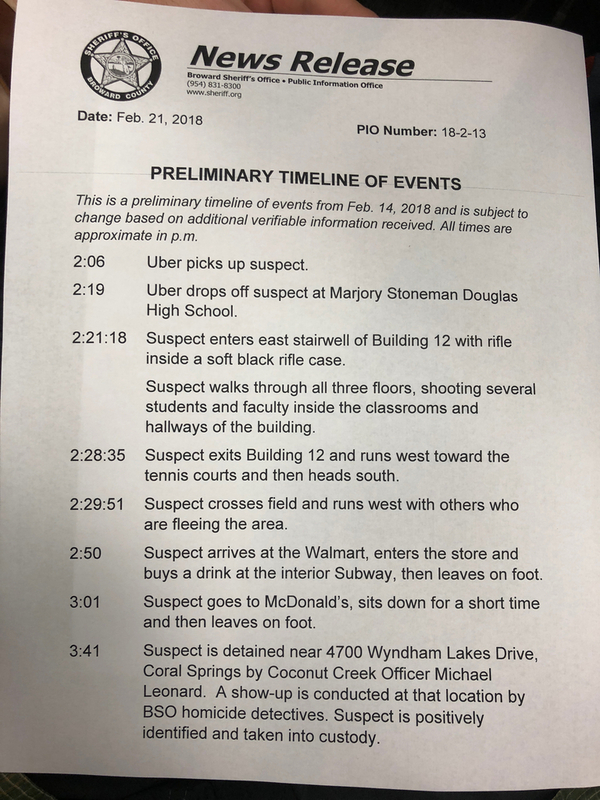 But the suspect had fled the building 26 minutes earlier at 2:28 p.m., according to a preliminary timeline provided by the Broward County Sheriff's Office.